What: A Vietnam War 50th Anniversary Commemoration Ceremony to thank and honor Veterans of the Vietnam War. When: March 30, 2019 at 10:00 a.m.
Background: The Department of Veterans Affairs Cape Canaveral National Cemetery will honor the service, sacrifice, and enduring achievements of the Armed Forces in a 50th Anniversary event. The event will commemorate Vietnam War Veterans and include a pinning ceremony to all Vietnam Veterans in attendance. The lapel pins will be presented in a dignified manner to each Vietnam Veteran during the event and include accompanying remarks to reflect the nation's thanks for their service and sacrifice. "Grateful Nation: from Sea to Shining Sea"
Scottsmoor, FL—The Support Committee at Cape Canaveral National Cemeteryand Cape Canaveral National Cemetery (CCNC) co-host the Vietnam War 50thAnniversary Commemoration to thank and honor veterans of the Vietnam War, including those held prisoners of war, or listed as missing in action, for their service and sacrifice on behalf of the United States and to thank and honor the families of these veterans. "Grateful Nation: from Sea to Shining Sea," provides all Vietnam veterans, including the less-fortunate veterans,the opportunity to receive their deserved recognition and official Vietnam 50th lapel pin. Eagle– Represents courage, honor, and dedicated service to our nation; Blue Circle– Matches the canton of the American flag and signifies vigilance, perseverance, and justice; Laurel Wreath– Victory, integrity, and strength; – represents the American flag; Star– the six allies who served, sacrificed, and fought alongside one another: Australia, New Zealand, the Philippines, the Republic of Korea Thailand, and the United States; – "a Grateful Nation Thanks and Honors You" is embossed on the back, closest to the heart. "The Vietnam 50thAnniversary lapel pin, although a small token, yet deep in heart and symbolism, proudly displays to everyone that Vietnam veterans, and their service to our country, are not forgotten. We mean to show are respect in honoring all our veterans and their service, from sea to shining sea. Some may not even know they are eligible for burial in a national cemetery." Marylou Wade, Event Chair. Dr. Floyd H (Hal) Kushner, (Vietnam POW, 1967-1973) is Guest Speaker. Hal, a Daytona Beach ophthalmologist, featured in the PBS documentary "The Vietnam War," shares his five and a half years of horrid survival as a Vietnam POW. Dennis Vannorsdall, Brevard County Veteran Services Manager will EMCEE to an anticipated crowd of 400. The program includes Reading of Names (Vietnam burials since March 2018), soloist Suzy Cunningham(NASA), Chaplain Craig "Doc" Glynn (Vietnam Green Beret medic), Vietnam Huey helicopter, and WWII C47 flyovers, Police & Fire Pipes & Drums, Terrier Sound band ensemble, Vietnam, POW/MIA, and Gold Star wreath presentations, along with formal military honors by the US Army. A Legacy Project group from California, working with the National Cemetery Administration will be filming the event for viewing on the History Channel. The program will end with an official Vietnam 50th Anniversary pinning ceremony. Contact: Marylou Wade, Chair, Vietnam 50thAnniversary Committee 321-223-5231 or email mlcwade@outlook.com. What: Cape Canaveral National Cemetery will host Wreaths Across America, an annual holiday wreath-laying ceremony to honor and remember our nation's Veterans. Betty Jo Green with the Wreaths Across America (WAA), is coordinating the event to honor Veterans of each branch of the military, the Merchant Marine as well as Prisoners of War and those still Missing in Action (POW/MIA). Individuals wishing to sponsor a wreath are encouraged to contact Betty Jo at bgreen700@aol.com. Who: WAA, Veterans Service Organizations, representatives from the military services, Veterans and their families. When: Dec. 15, 2018, at 11:45 a.m.
Background:	The Worcester Wreath Company, through a campaign called Wreaths Across America, began donating holiday wreaths in tribute to Veterans laid to rest at VA national cemeteries and state Veterans cemeteries in 2006. In the spirit of honoring Veterans at this time of year, Betty Jo Green with the WAA, is coordinating the ceremony for Cape Canaveral National Cemetery as a part of the national Wreaths Across America effort. For more information on this event, visit the website at https://www.wreathsacrossamerica.org/. Scottsmoor, FL -- On October 31, 2018 President Donald Trump declared November 2018 the second annual National Veterans and Military Families Month to "salute the brave and dedicated patriots who have worn the uniform of the United States, and...celebrate the extraordinary military families whose selfless service and sacrifice make our military the finest in the world." In 2017, President Trump proclaimed November Veterans and Military Families Month, marking the first time America celebrated Veterans and military families for the entire month and not just on Veterans Day, in keeping with the President's strong focus on improving care and benefits to our nation's heroes. "We come together to remember, honor and pay tribute to our nation's heroes" said Cemetery Director Don Murphy. "These events at Cape Canaveral National Cemetery are a special way to say thank you to service members past and present, and to let them know that the sacrifices of our nation's Veterans will never be forgotten." The full list of national events for Veterans and Military Families month is available at this link and national cemetery events at this link. 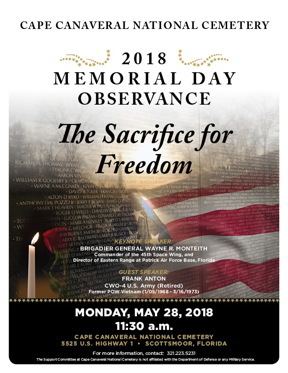 Scottsmoor, FL — The Support Committee at Cape Canaveral National Cemetery and the Cape Canaveral National Cemetery (CCNC) are co-hosting the Memorial Day Observance to recognize and commemorate the sacrifices of the fallen men and women of the U.S. Armed Forces. This being our third Memorial Day Observance, we are so pleased to announce it will include our first flyover. With focus on the Vietnam War era, I'm happy, beyond words, that we were able to secure a "Huey" helicopter for the flyover. The "Huey" is the icon for this war. This year's theme "The Sacrifice for Freedom," encompasses not only those who gave the ultimate sacrifice, but also recognizes the surviving veterans, their families, the Missing In Action and Prisoners of War, while highlighting the Vietnam War era. Patriotic music will be performed by Brevard Police & Fire Pipes & Drums. Brevard County Sheriff Wayne Ivey will emcee the event to an anticipated crowd of 600-700. Frank Anton, CWO-4, U.S. Army, (Retired), former Vietnam POW (1968- 1973) is Guest Speaker. Frank retired from the Army as a CWO-4 after 21 years of service. He then flew 727s for American Airlines until retiring in 1997. Brigadier General Wayne R. Monteith from Patrick Air Force Base (PAFB), is Keynote Speaker. General Monteith is the Commander of the 45th Space Wing, and Director of Eastern Range at PAFB. The Missing Man Table and Honors will be presented. Set for six, the empty chairs represent Americans who were or are missing from each of the services — Army, Marine Corps, Navy, Air Force, Coast Guard, and civilians. The program will end with a Vietnam 50th Anniversary pinning ceremony. Any Vietnam Veteran who has not received the Vietnam 50th Anniversary pin will be pinned by General Monteith, Frank Anton, or Don Murphy (Cemetery Director). What: A Vietnam War Anniversary ceremony to thank and honor Veterans of the Vietnam War. When: March 29, 2018 at 10 a.m.
Background: The Department of Veterans Affairs, Cape Canaveral National Cemetery will honor the service, sacrifice, and enduring achievements of the Armed Forces with an anniversary event. The event will commemorate Vietnam War Veterans and include a wreath laying and pinning ceremony to all Vietnam Veterans in attendance. A live reading of names of all Vietnam Veterans who are interred at the cemetery will be incorporated into the ceremony. The Honorable Bill Posey, Member, U.S. House of Representatives, 8th Florida District, will be the guest speaker. The lapel pins will be presented to each Vietnam and Vietnam era veteran after the event. Dec. 16, 2017, at 11:45 a.m.
Cape Canaveral National Cemetery will host Wreaths Across America, a holiday wreath-laying ceremony to honor and remember our nation's Veterans. The Wreaths Across America Brevard and the Support Committee at Cape Canaveral National Cemetery are coordinating the event to honor Veterans of each branch of the military, the Merchant Marines as well as Prisoners of War and those still Missing in Action (POW/MIA). LTC (Ret.) Danny McKnight will be the keynote speaker and Sherriff Wayne Ivey (Brevard County) will be the guest speaker. Betty Jo Green, Chair, Wreaths Across America Brevard will Emcee the ceremony. Sponsored by: Wreaths Across America Brevard, Support Committee at Cape Canaveral National Cemetery, Veterans and their families. Background:	The Worcester Wreath Company, through a campaign called Wreaths Across America, began donating holiday wreaths in tribute to Veterans laid to rest at VA's national cemeteries and state Veterans cemeteries in 2006. Since 1992, they have donated wreaths for gravesites at Arlington National Cemetery. The Wreaths Across America Brevard and the Support Committee at Cape Canaveral National Cemetery is coordinating the wreath ceremony. For more information on this event, visit the National Cemetery Administration website at www.cem.va.gov. This cemetery has in-ground burial space available to accommodate casketed and cremated remains. The new 318-acre cemetery in Mims, Fla., will serve the burial needs of more than 163,000 Veterans in the cemetery's service area for the next 100 years. The Department of Veterans Affairs (VA) purchased the land in July 2012 for $2.1 million. The initial phase of construction will provide for approximately 17,000 gravesites and accommodate both casket and cremain interments. In addition to gravesites and columbaria, the cemetery will include other features such as a front entrance on U.S. Route 1, a public information center with an electronic gravesite locator and restrooms, an administration building, a maintenance building, a flag pole assembly area, a memorial wall with ossuary and walkway, and committal shelters. Other cemetery infrastructure features will include roads, landscaping, utilities, and irrigation. From I-95 take Exit 231, at Highway 1 turn right (south); the cemetery is two miles on the left. Saturday November 4, 2017 at 2:00 p.m. The Florida Federation of Garden Clubs (FFGC) will host a dedication and unveiling ceremony for the Blue Star Memorial at Cape Canaveral National Cemetery on Saturday, November 4, 2017 at 2:00 p.m. The guest speaker will be Florida State Senator Dorothy Hukill. The welcome address will be given by Zetta Gillespie, Director, District VI, FFGC. Other speakers include Kathleen Terlizzo (Past District VI Director), the Reverend Dr. Susan Pollizzi, Carolyn Schaag, Gloria Blake, and Arlene Rand. The event is open to the public. Guests should arrive no later than 1:30 and parking is available at the Public Information Center / Administrative Office. The ceremony scheduled for Sunday, September 10th has been cancelled at the request of the hosting organization. Instead, the Boy Scouts will be at Cape Canaveral Cemetery this Friday, approximately 10am - 2pm, to do a live reading of names and place commemorative coins on all headstones. Thank you all for publishing corrections to this advisory, and as always, feel free to call me with any questions you may have. 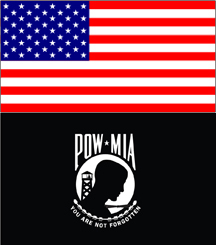 When:	Sunday September 10, 2017 at 8:30 a.m.
Background: The 2nd Annual POW/MIA-OREE (Prisoner of War, Missing in Action, Outdoor Remembrance Educational Event), will be held at Cape Canaveral National Cemetery on Sunday, September 10, 2017 at 8:30 a.m. POW-MIA-OREE is the only event that live reads all the names of all who are interred at Cape Canaveral National Cemetery. Following the live reading a custom challenge coin will be placed on every headstone for the Next of Kin of those interred. Each coin signifies that "No Veteran Should Ever Be Forgotten". This program supports the National POW/MIA Remembrance Day which is observed on the third Friday each September. This event is hosted by its Founder Joshua Katz, Eagle Scout. The ceremony will be conducted by Joshua and Scout Troop 337, and supported by Boy Scouts from all over Florida. The event is open to the public. Guests should arrive no later than 8:15 and parking is available adjacent to the Flag Assembly Area. 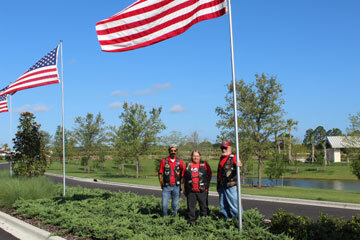 Mims (Scottsmoor), FL - Members of the Deland based Patriot Guard Riders assisted Cape Canaveral National Cemetery staff with displaying the Avenue of Flags in recognition of Flag Day on June 14th. Flag Day commemorates the adoption of the flag of the United States, which happened on June 14, 1777, by resolution of the Second Continental Congress. Generally, a burial flag is given to the next-of-kin, as a keepsake, after its use during the funeral service for a Veteran. Families of Veterans may donate the burial flag of their loved one to be included in the Avenue of Flags program. The Avenue of Flags is a display of respect for the service performed by our nation's Veterans, and they will line the main entrance way of Cape Canaveral National Cemetery on Memorial Day, Veterans Day, Flag Day, Independence Day, and to observe the Wreaths Across America ceremony normally held the second Saturday in December. "The Avenue of Flags is an additional compliment to the overall landscape of our new national cemetery and helps us continue the mission of maintaining national cemeteries as national shrines, sacred to the honor and memory of those interred or memorialized here," said cemetery director Don Murphy. 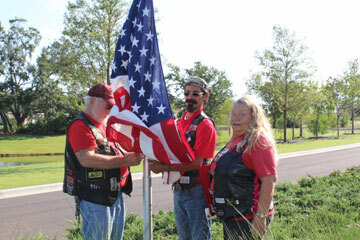 "It is a great way for families of deceased Veterans to donate their flag and enjoy the beauty of it on display along the main entrance drive each time they visit these hallowed grounds when the Avenue of Flags are on display." For more information about the Avenue of Flags program, call the cemetery administration office at 321-383-2638 or visit the National Cemetery Administration website at www.cem.va.gov. May 27, 2017 at 10:00 a.m. The Department of Veterans Affairs, Cape Canaveral National Cemetery will honor the service and sacrifice of our Nation's Veterans on Memorial Day. The second Memorial Day Ceremony at the new national cemetery is hosted by the Support Committee at Cape Canaveral National Cemetery. The theme for the program will be "Space for Veterans", officially naming the roadways in the national cemetery. Greg Pallone, Central Florida News 13, will serve as the Master of Ceremonies. Presentation of Colors and Rifle Salute will be provided by the Patrick Air Force Base Honor Guard. The National Anthem will be performed by Jocelyn Evans, Astronaut High School, Titusville. The Pledge of Allegiance will be rendered by the Mims Boy Scout Troop 360. A wreath presentation will be made by Margie Collins and Chip Hanson, Brevard Veterans Council and Veterans Memorial Center, Brevard County. Amazing Grace will be performed by Jamie Holton (Bagpiper), Orlando. Patriotic music and Taps will be performed by the Florida Marching Arts, Inc. (formerly Impact of Orlando Drum and Bugle Corps). Invocation will be given by Father Rob Goodridge, Rector, St. Gabriel's Episcopal Church, Titusville. A musical prelude will begin at 9:45 a.m. and seating will be available for the first 600 guests. Lawn chairs are also welcome for use after the seats are full. Guests are encouraged to arrive no later than 9:15 to allow ample time to park and be transported to the ceremony area prior to the prompt start of the program at 10:00 a.m. Parking assistance will be available after entering the main entrance gate. Thursday, April 6, 2017, 10:00 a.m.
A Wreath-laying ceremony will commemorate the U.S. involvement in World War I. The National Cemetery Administration announced its national cemeteries will host wreath-laying ceremonies to commemorate the 353,082 World War I Veterans interred in VA national cemeteries across the country. The Department of Veterans Affairs Cape Canaveral National Cemetery will host a wreath-laying ceremony to commemorate the centennial of U.S. involvement in World War I on Thursday, April 6, 2017, at 10:00 a.m.
On April 2, 1917, President Woodrow Wilson asked Congress to declare war on the German Empire after attacks on American ships and commercial ships transporting American passengers. On April 6, 1917, Congress voted to declare war on the German Empire. 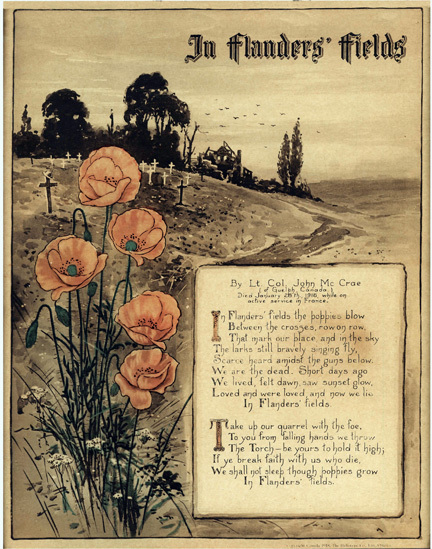 When the war ended Nov. 11, 1918, more than 2 million Americans had served. Don Murphy, Cemetery Director. Office: (321) 383-2638. Mims (Scottsmoor), FL -- Volunteers placed holiday wreaths to honor and remember our nation's Veterans at the Department of Veterans Affairs' Cape Canaveral National Cemetery today. "These wreath laying ceremonies help us continue the mission of maintaining national cemeteries as national shrines, sacred to the honor and memory of those interred or memorialized here," said cemetery director Don Murphy. "It is a great way for the community to come together to pay our respects during the holiday season." The organization arranges the wreath-laying ceremony with assistance from local citizens and other Veterans service organizations as a part of Wreaths Across America. All 135 VA national cemeteries receive at least seven wreaths, one for each service branch, one for the Merchant Marines and one for Prisoners of War and those Missing In Action (POW/MIA). This is the eleventh year of Wreaths Across America, a nationwide program which distributes holiday wreaths as a tribute to Veterans laid to rest at VA national cemeteries and state Veterans cemeteries. It is also the 25th year that the Worcester Wreath Company of Harrington, Maine, have provided holiday wreaths to Arlington National Cemetery. Through this program, company president Morrill Worcester seeks to recognize Veterans, active duty military and their families. His goal is to remind the public to remember the Veterans, honor their service, and teach children the value of freedom. For more information about this event, call the cemetery administration office at 321-383-2638 or visit the National Cemetery Administration website at www.cem.va.gov. Mims, Florida - The U.S. Department of Veterans Affairs (VA) announced that it now provides eligibility determinations for burial in a VA national cemetery prior to the time of need. Pre-need eligibility determinations will streamline access to burial benefits that Veterans have earned through military service for themselves and their eligible family members. Pre-need eligibility determinations will help Veterans and their families with pre-need burial planning. "A pre-need burial eligibility determination will confirm an individual's eligibility for burial in a VA national cemetery prior to the time of need" said Cape Canaveral National Cemetery Director Don Murphy. "I encourage Veterans and their spouses to take advantage of the new program so they have peace of mind and can address burial plans ahead of time." Mail to the National Cemetery Scheduling Office, P.O. Box 510543, St. Louis, MO 63151. VA will review applications and provide written notice of its determination of eligibility. VA will save determinations and supporting documentation in an electronic information system to expedite burial arrangements at the time of need. Because laws and personal circumstances change, upon receipt of a burial request, VA will validate all pre-need determinations in accordance with the laws in effect at that time. VA operates 135 national cemeteries and 33 soldiers' lots in 40 states and Puerto Rico. More than 4 million Americans, including Veterans of every war and conflict, are buried in VA's national cemeteries. VA also provides funding to establish, expand and maintain 105 Veterans cemeteries in 47 states and territories including tribal trust lands, Guam, and Saipan. For Veterans buried in private or other cemeteries, VA provides headstones, markers or medallions to commemorate their service. In 2016, VA honored more than 345,000 Veterans and their loved ones with memorial benefits in national, state, tribal and private cemeteries. Eligible individuals are entitled to burial in any open VA national cemetery, opening/closing of the grave, a grave liner, perpetual care of the gravesite, and a government-furnished headstone or marker or niche cover, all at no cost to the family. 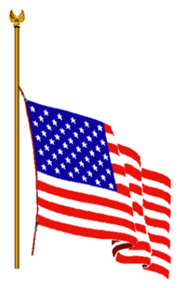 Veterans are also eligible for a burial flag and may be eligible for a Presidential Memorial Certificate. What: A Vietnam War Anniversary wreath laying ceremony to thank and honor Veterans of the Vietnam War. When: March 29, 2017 at 10 a.m.
Background: The Department of Veterans Affairs Cape Canaveral National Cemetery will honor the service, sacrifice, and enduring achievements of the Armed Forces with an anniversary event. The event will commemorate Vietnam War Veterans and include a wreath laying and pinning ceremony to all Vietnam Veterans in attendance. The lapel pins will be presented in a dignified manner to each Vietnam veteran during the event, and include accompanying remarks by cemetery staff and members of the Support Committee at Cape Canaveral National Cemetery, to reflect the nation's thanks for their service and sacrifice. The first phase of construction at Cape Canaveral National Cemetery in Mims (Scottsmoor), Florida, is nearly complete and the cemetery staff is planning to move from temporary facilities to the new permanent buildings in April. The cemetery has been conducting in-ground burials for casketed and cremated remains while operating in a small completed portion of the Phase I property. 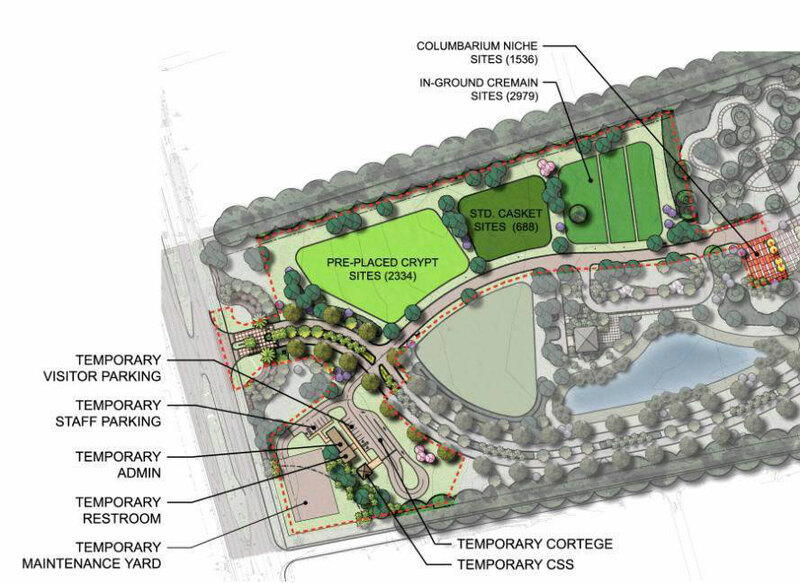 The move to permanent facilities also includes activation of the cemetery's columbarium, which is an above ground courtyard structure consisting of 7,200 niches, for placement of cremation urns. The 318-acre cemetery began interments Jan. 12, 2016. The VA national cemetery serves the burial needs of more than 163,000 Veterans in the Space Coast area, including Orlando and Daytona. VA purchased the land in July 2012 for $2.1 million. The property is located along U.S. Route 1 in Scottsmoor, in northern Brevard County, 2 miles south from Interstate 95, Exit #231, and 12 miles north of Titusville. "More than 300 families had completed the burial scheduling process when we opened for burials Jan. 12, 2016," said Cape Canaveral National Cemetery Director Don Murphy. "Today, after just a year of conducting interments, nearly 1,700 Veterans and their family members have been laid to rest in this national shrine. When construction is complete, which includes the columbarium, we will have a second burial option for Veterans and their eligible family members who are cremated," Murphy said. Murphy also indicated 200 families have been waiting for the columbarium to be completed so they can schedule interment of their loved one in the new courtyard above-ground structure. 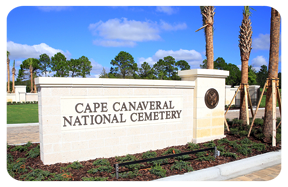 Cape Canaveral National Cemetery will begin accepting applications for inurnment of cremated remains of deceased eligible Veterans and their spouses on Monday, Feb. 13, 2017. The next of kin (NOK) or funeral home acting on the family's behalf, may request inurnment in the columbarium at Cape Canaveral National Cemetery by contacting VA's National Cemetery Scheduling Office (NCSO) in St. Louis, Missouri. First, send a copy of the military discharge documents to the NCSO by fax at 866-900-6417 or email at NCA.Scheduling@va.gov. Next call the NCSO toll free at 800-535-1117 to complete the application process. After construction is complete and the columbarium is available, cemetery staff will contact the NOK of who have completed the application process to schedule a date and time for the committal service of their loved one. Burial in a VA national cemetery is open to all members of the armed forces and Veterans who have met minimum active duty service requirements and were discharged under conditions other than dishonorable. Their spouse, widow or widower, minor children, and, under certain conditions, unmarried adult children with disabilities, may also be eligible for burial. Eligible spouses and children may be buried even if they predecease the Veteran. Members of the reserve components of the armed forces who die while on active duty or who die while on training duty, or were eligible for retired pay, may also be eligible for burial. VA provides the gravesite, opening and closing of the grave, government headstone or marker, U.S. burial flag, Presidential Memorial Certificate and perpetual care of the gravesite at no cost to the family. For questions regarding burial eligibility and burial application at the cemetery, please contact the Cape Canaveral National Cemetery staff at 321- 383-2638 Monday through Friday, 8 a.m. to 4:30 p.m.
For more information on this event, visit the National Cemetery Administration website at www.cem.va.gov. November 20, 2015 — 2:00 p.m.
Buriels are planned to start in December. Veterans and their families can get information about buriels by calling 321-383-2638 weekdays between 8:00 a.m. and 4:30 p.m. Cemetery staff also can be reached at the temporary office trailer north of the cemetery entrance. Veterans with a qualifying discharge, their spouses and eligible dependent children can be buried in a VA national cemetery. Also eligible are military personnel who die on active duty. Other burial benefits available for eligible Veterans, regardless of whether they are buried in a national cemetery or a private cemetery, include a burial flag, a Presidential Memorial Certificate, and a government headstone or marker. Information on VA burial benefits can be obtained from national cemetery offices, from the Internet at www.cem.va.gov, or by calling VA regional offices toll-free at 800-827-1000. Official information about Cape Canaveral National Cemetery can be found here. To make burial arrangements at any VA national cemetery at the time of need, call the National Cemetery Scheduling Office at 800-535-1117. WASHINGTON – The Department of Veterans Affairs (VA) has announced the names of two new VA national cemeteries planned in Florida -- the Cape Canaveral National Cemetery in Scottsmoor and the Tallahassee National Cemetery in Tallahassee. "These two new cemeteries are a priority for the growing Veterans' community in Florida," said Secretary of Veterans Affairs Eric Shinseki. "As VA moves forward with these new cemeteries, Veterans, their spouses and families can have peace of mind knowing that they have a final resting place in a nearby national shrine." The Cape Canaveral National Cemetery is planned for a 318-acre parcel located in close proximity to U.S.1 in northern Brevard County, approximately two miles from Interstate 95 and 12 miles north of Titusville. The cemetery will serve more than 163,000 Veterans, spouses and their eligible dependents living in the central eastern Florida area. 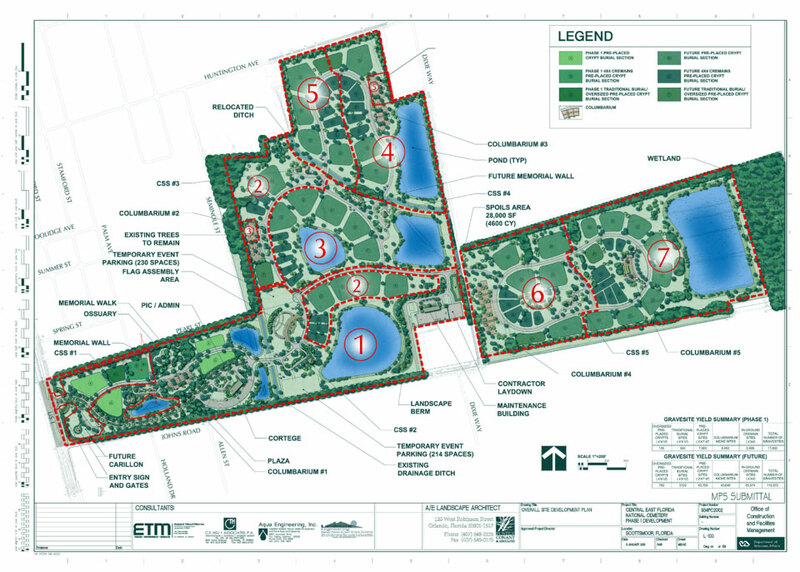 The initial phase of construction will provide more than 17,000 gravesites. VA purchased the property, formerly known as Acosta Groves, for $2.1 million on July 31, 2012. 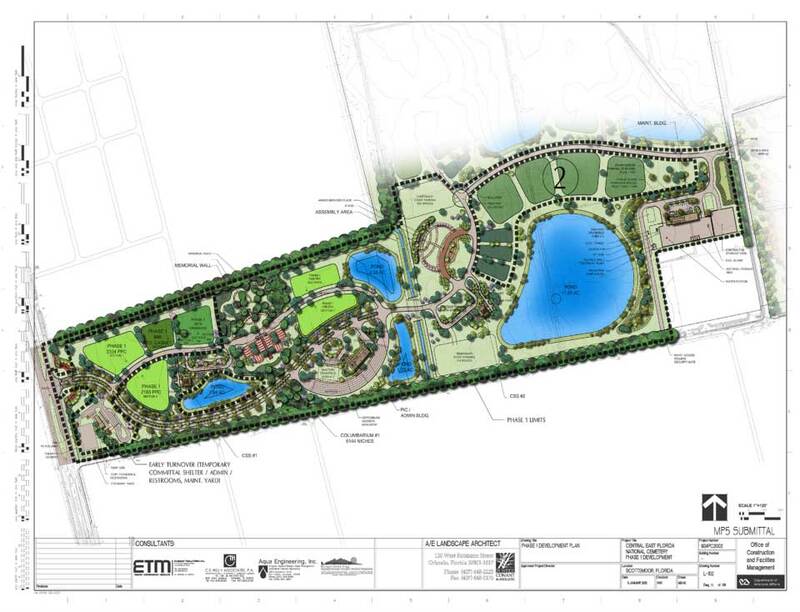 The Tallahassee National Cemetery is planned for a 250-acre parcel in Leon County,and will serve 83,000 Veterans and their eligible dependents in the Tallahassee area, as well as southwestern Georgia and southeastern Alabama. VA purchased the Tallahassee property for $6.8 million on Aug. 14, 2012. In the midst of the largest expansion since the Civil War, VA operates 131 national cemeteries in 39 states and Puerto Rico and 33 soldiers' lots and monument sites. More than 3.8 million Americans, including Veterans of every war and conflict, are buried in VA's national cemeteries. Information on VA burial benefits can be obtained from national cemetery offices, from the Internet at www.cem.va.gov, or by calling VA regional offices toll-free at 800-827-1000. To make burial arrangements at any VA national cemetery at the time of need, call the National Cemetery Scheduling Office at 800-535-1117.